The ArkHive 400+ - Is the ultimate box for storing and carrying large numbers of cards and/or multiple cases in many different ways! It's modular design is perfectly shaped to hold an almost endless variety of Ultimate Guard products. Some examples of what this amazing box can hold: 4x Boulder Deck Case 100+ or 3x Deck Case 100+ plus extra storage space, 430+ double-sleeved cards or 500+ single-sleeved cards, or 850+ unsleeved cards. 175+ Top-Loaders. ​Boulder 100+ Deck Case: Optimized for double-sleeved cards. 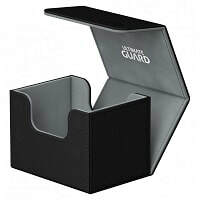 Holds up to 100 double-sleeved cards or 120 single-sleeved cards. Modular Design: Designed to fit perfectly into other Ultimate Guard products, such as: Flip'n'Tray™ Deck Case 80+/100+, Twin Flip'n'Tray™ Deck Case 160+/200+, ArkHive™ 400+, and SuperHive™ 550+ Optimized shape Cover has same Size and shape as bottom section, to be used as a second card holder when opened. Deck trays for Flip'n'Tray: Both parts are ideally fitted to be used as extra deck trays for all Flip'n'Tray Cases. 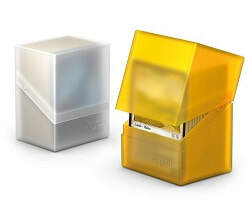 Easy card access by just tilting the cover, symmetrical structure providing both secure closure and easy opening. Durable and rigid box with solid material with soft touch finishing. 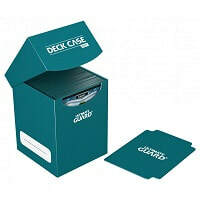 ​Deck Case 100+ - Holds up to 100 double-sleeved cards or 120 single-sleeved cards. The durable and rigid box protects your cards during transport and keeps your collection safe during storage, Self-Locking, no need for hook-and-loop fastening or the like! 0.7 mm strong polypropylene thick material, extra sturdy box. Write-on strip: Convenient two-line labeling strip that helps you keeping track of your cards and organizing your collection. Including 1 card divider, which is great for indexing your card collection and separating decks from one another. Acid free, no PVC. ​Digital Life Pad - The Digital Life Pad is a handy, easy-to-use and eco-friendly writing tablet for your everyday writing and scribbling needs. The perfect gaming companion for keeping score or counting your life points! 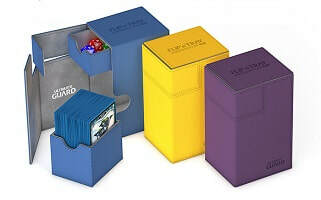 ​Flip'n'Tray 100+ - Premium quality XenoSkin card box with magnetic closure and card & dice trays for the protection and archival safe storage of more than 100 double-sleeved cards in standard size. With very string closure incorporating four magnets. Removable card and dice trays give you independant access to cards and accessories. Anti-Slip XenoSkin texture with microfibre inner lining. 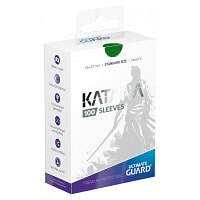 Katana Sleeves - Protect your cards like a Samurai would with our brand-new Katana sleeves! Honoring the tradition of pristine Japanese craftsmanship, these precision-made and extremely durable sleeves are ideal for tournament gameplay. They are fully opaque, great for shuffling and meet the highest standards of players and collectors, available in ten colours (Transparent, Green, Turquoise, Red, Purple, Black, Blue, Orange, White, and Yellow). ​Sidewinder 100+ - The innovative Sidewinder Deck Case provides a super easy access from both sides to your card deck. 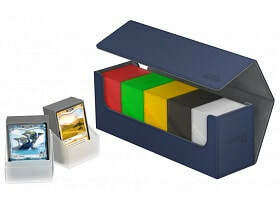 Ideal for the protection and archival safe storage of double-sleeved cards in standard size. Optimized for double-sleeved cards, holding up to 100 doubled-sleeved cards with extra easy access. When fully opened, the 3-fold lid leaves the box open to both sides for an easy extraction of the deck. The anti-slip characteristics of the microfibre inner lining makes the fully opened lid card stack ready. With XenoSkin cover material and strong closure, supported by 4 magnets for a precise and secure closure. SuperHIve 550+ - This ultimate box leaves nothing to be desired! 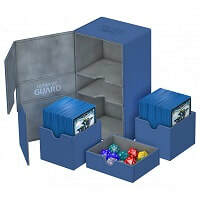 There is space for everything you will need, with compartments for multiple card decks and cases, two play-mats and accessories like dice, tokens and life counters! Some examples of what this amazing box can hold: 4x Sidewinder 100+ plus extra storage space. 5x Boulder Deck Case 100+. 550+ double-sleeved cards or 650+ single-sleeved cards or 1100+ unsleeved cards. Modular in design, convenient, and super spacious, great for cubing, innovative anti-slip texture, microfibre inner lining. Five magnets for a precise and robust closure. ​Twin Flip'n'Tray: Super high quality XenoSkin card box with magnetic closure and card & dice trays for the protection and archival safe storage of more than 200 double-sleeved cards in standard size. Very Strong Closure with five magnets incorporated, Durable double layer skin for maximum protection. With anti-slip Xenoskin texture and microfibe inner lining. The removable card and dice trays give you independent access to cards and accessories: 2 card trays and 1 dice tray included. 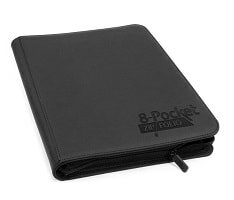 ZipFolio - Available in 3 different sizes: High quality Portfolios with flexible and durable cover, innovative XenoSkin™ surface in 20 integrated 8-pocket-pages, 20 integrated 9-pocket-pages, and 20 integrated 4-pocket-pages for all standard and Japanese sized gaming cards. Zipper closure for extra security! A range of colors also to choose from!